Element is a family owned and operated business with the whole family living and breathing the experience. 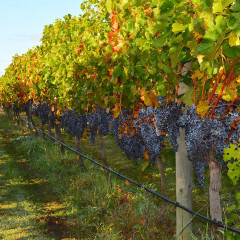 The family uprooted from Auckland in 2012 and moved to what is now known as Element Vineyard, the smallest of the vineyards located on the GIMBLETT GRAVELS WINE GROWING DISTRICT. Element has a total area of 4.27 ha with only 2.66 ha planted. The block was established in 2005 with Cabernet Sauvignon, Merlot, Syrah and Viognier. Rachelle and Brewski (the German Shorthaired Pointer) spend much of their time in the vineyard making sure the fruit arrives at harvest in pristine condition. Dom works full time at a local winery which is also where we are all hands on crafting our grapes into fine wine. Our 2 girls Zoë 12 and Zaymia 10 love getting stuck in to the hard work, but none so much as fruit sampling at harvest.